Ever wonder what it’d be like to drive a car that gets 100 miles to the gallon? You don’t have to wait until 2015, the deadline President Barack Obama set in his New Energy For America plan to put one million plug-in hybrid electric vehicles (PHEVs) on the road. Thanks to generous support from ComEd, I-GO just added two plug-in hybrids to its fleet. The cars—converted 2009 Toyota Priuses—are located in the Millennium Park north garage at 201 E. Randolph Dr., and at 900 S. Clark St. in the AMLI 900 residential tower’s garage. On a fully charged battery, these cars are capable of achieving fuel economy in excess of 100 mpg and reducing CO2 emissions by up to two-thirds over the standard Prius. But don’t take it from us. Try them out for yourselves. To reserve the cars, I-GO members can simply select “Toyota Prius Plug-In Hybrid” on the Vehicles drop-down menu on our website after you log in. Or enter the vehicle ID numbers in the space below the menu: 4405 for 900 S. Clark, 4403 for Millennium Park, 201 E. Randolph. 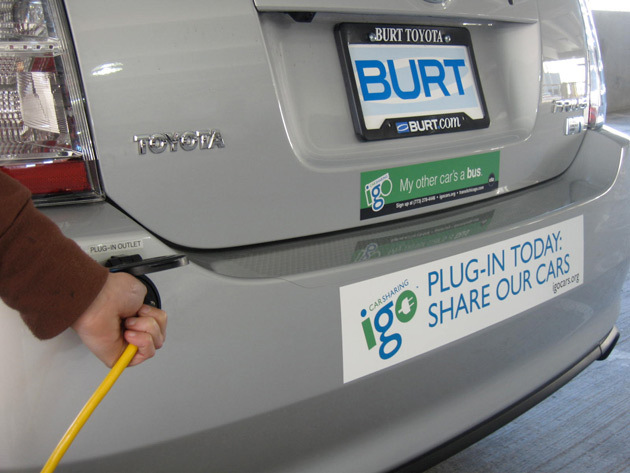 Operating the cars is similar to that of a normal Prius (and if you need tips on that, check out the Toyota Prius Quick Guide in the I-GO Member Manual). The difference, of course, is that, before you can start the car you’ll need to unplug the extension cord from the back of the car and recoil it on the spool located next to the garage wall. (Please don’t leave the cord laying on the floor, where it may get run over and damaged.) Then, after you return the car and swipe out with your smart card, just remember to plug it back in. Simple, right? Plug-in hybrids might be technological marvels, but fortunately, you don’t have to be a rocket scientist to drive one. You just have to be an I-GO member. You are currently browsing the archives for the PHEV category.